YaifO 0.2 has been released. This extremely cool tool allows you to remotely install/upgrade to OpenBSD. I used it for the first time today to upgrade a file server at home. It was running OpenBSD 3.7. On my desktop (running OpenBSD 3.8 with the source tree in /usr/src). I downloaded and extracted YaifO to my desktop and changed into its directory. Copied my authorized_keys file there and edited the config file in that directory. Then, I ran "make obj" and "sudo make". The only modification it made to my desktop system was to install the crunchgen utility that's used to make boot floppy images. Then, it builds a setup boot disk called yaifo.fs and a ramdisk image called yaifo.rd. When Verizon came to install FiOS at my house, they didn't immediately bury the cable from the curb to my house. During the day today, I was unable to connect back to my servers at home. When I got home, I found that the cable was buried so I had been disconnected. I'm sure the Dlink that Verizon provides would have happily reconnected and I would have been able to reconnect, but my OpenBSD box did not reconnect. After doing some looking through the misc -at- openbsd -dot- org archives, I found someone that came up with a quick, simple solution to this problem. So Verizon installed FiOS at my house today. I had been with Comcast for 8 years and now they're finally going to be out of my house. :) Last year DirecTV, this year FiOS. OpenBSD founder Theo DeRaadt celebrated his May 19th birthday (his 37th) by releasing OpenBSD 3.7. As with every release, I found myself saying (as with every new release), "I can't wait until 3.7 is released." This release, at least for me, didn't bring about anything very new. There were many, many improvements to existing features I already depend on. Package upgrades are now possible with "pkg_add -r". Dell PERC drivers are now supported (or better supported). And, for me, just more general stability. I have a firewall that would just hang. Simple IDE-based, i386 PC (P3 500, 64 MB RAM). Since upgrading to OpenBSD 3.7 (slightly before 5/19 since I pre-ordered), the firewall has been rock-solid. Finally: many, many, many package upgrades/additions (including ClamAV). As sad as I was to lose my Prelude, I'm very excited to drive my new car: A brand new Acura TL! It's black with black interior. It's a 6-speed manual transmission and it has the NAVI (navigation system). It's a VERY nice ride and SO much fun to drive. I woke up "early": 7:00. I got ready, took care of the dogs, kissed my wife and headed out. As traffic thickened, I had to slam on my brakes to avoid the person in front of me. See... either they have bad brake lights or were riding the brakes. I was staring at their tail (why does that sound nasty), but I don't remember seeing a change in brake lights as I realized they were stopped and slammed on the brakes. Well... the guy behind me slammed in to me. My trunk is basically gone. At first I felt fine. But, then, my neck started stiffening up. I went to the doctor and that's really all it is: minor whiplash. So.. anyway... renting a car and looking for something affordable. After setting up WordPress and another MySQL-based application on my OpenBSD 3.6 server and then referencing a link to my website on OpenBSD's misc @, MySQL kept dying. The biggest problem with that was: WordPress's database errors occurred prior to HTML headers being sent. So, I never saw any reference to any errors until using curl to download the page. A very effective way to filter viruses and SPAM for multiple email domains is to use OpenBSD, OpenBSD's spamd, ClamAV and SpamAssassin with OpenBSD's included version of sendmail. You can also use this configuration as a mail gateway in front of Microsoft Exchange servers if you have concerns with putting Exchange's SMTP port "on the Internet." SpamAssassin is an open-source spam filter. It uses a variety of tests to determine if an email message is SPAM or not. If determined SPAM, it can change the subject and the header of the message so that your mail program can move the message to a different folder (clearing up your Inbox). For erdelynet.com, I do not use a site-wide configuration, but in other SpamAssassin installations I maintain, I do. Here's how to set up SpamAssassin in a site-wide configuration on OpenBSD 3.6. SpamAssassin is an open-source spam filter. The package/port shipping for OPENBSD_3_6_BASE (what's on your CD... you bought a CD, right?) is an older version of SpamAssassin. The version of SpamAssassin that is included with OpenBSD-current (OpenBSD 3.7-beta) compiles and installs cleanly on OpenBSD 3.6. 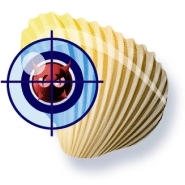 ClamAV, the GPL antivirus package for *nix will be included in OpenBSD 3.7 (which will be released on May 19). Before ClamAV was added to OpenBSD's ports tree, www.fatbsd.com had been maintaining a port. After the addition of the port, this site stopped providing the port. OpenBSD Pre-Orders are now open at http://www.openbsd.org/orders.html. This looks to be their best release yet... but then I've said that about every release. So, go ahead... pre-order a CD... a shirt... and drop a few dollars for the cause. Use OpenBSD... You'll be glad you did. I'm Mike Erdely. I'm married to a beautiful, wonderful woman: Holly. She's my best friend. 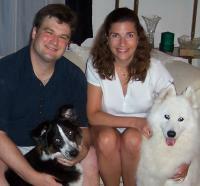 We don't have kids, but we have pets: a cat (Samantha) and two dogs (Cali & Sydney). Putty is a free SSH client for Windows. The Putty project also includes a command line client (plink), an scp client (pscp), an sftp client (psftp) and an ssh-agent application (pageant). AdiumX is a multi-protocol Instant Messaging client for Mac OS X.
AdiumX is fantastic! It's still a little immature (pre-1.0) but the potential makes it easy to overlook the occasional bug or crash. Firewall: OpenBSD's pf filters connections for hosted server. At home, it provides Internet access for my LAN and wireless networks while protecting my LAN from my wireless network. Apache: With Apache, I serve this site (erdelynet.com). On February 14, ex-Prime Minister of Lebanon, Rafik Hariri was murdered by a car bomb explosion that killed 18 people. From everything I've read and everything I've been told since then, Mr. Hariri was a great man who could easily be compared with JFK or MLK. Even before the war in Lebanon ended, Mr. Hariri was already leading a rebuilding campaign that lasted years. He invested much of his own personal fortune to rebuild (and build new) schools, hospitals, hotels, the airport, etc, and brought them back into a thriving nation. Today, Holly and I attended a memorial for Mr. Hariri at Georgetown University put on by the Hariri Foundation. It was very moving to hear some of the things that the very prominent people had to say. Before the speakers began, movies about Mr. Hariri's life were shown. OpenSSH 4.0 was released today! See my SSH section for more info. Ext2Fsd is a Linux file system driver (ext2) for Windows. It supports ext2 and ext3 with write support for ext2.